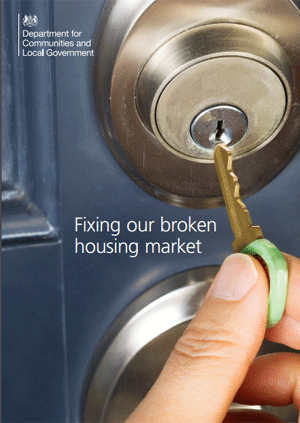 When will the government’s new White Paper ‘Fixing our broken property market’ impact on landlords? The much-publicised government White Paper on housing in England, which lays out their future housing strategy, has now been launched. It contains 104 pages of information, analysis and new policy suggestions and asks for feedback - not just from the industry, but from the general public as well. You can download the full document here*, if you’d like to read it. It’s fairly easy to navigate through, as the actual policies laid out in the first 60 pages are clearly summarised, while the rest of the document is about securing feedback to consult on the new cabinet’s thoughts and ideas of how the property market can be improved. One of the criticisms of previous governments is that their policies have been too ‘sector focused’, for example, looking at building new homes, but not linking this to the impact on the private rented sector or people’s social housing needs. The new paper does try to address this issue and move away from the previous cabinet’s view that the main strategy should be geared towards home ownership. Perhaps surprisingly to most landlords, it also accepts that the Private Rented Sector is here to stay and that there is a demand for decent, affordable homes to rent as well as buy. So, delivering new homes more quickly is the main part of the White Paper and the consultation focuses primarily on how that can be achieved. The paper draws together all the current initiatives to drive new housing stock for both ownership and renting in the private and social sectors. It also considers policies to help people onto the housing ladder, reduce costs for those in the private rented sector and help those who can’t afford to live in the private sector by improving affordable and/or council housing. Over 40 per cent of local planning authorities do not have a plan that meets the projected growth in households in their area. The pace of development is too slow. This government’s reforms have led to a large increase in the number of homes being given planning permission, but there is still a large gap between permissions granted and new homes built. The current structure of the housing market makes it harder to increase supply. The belief is that this is due to a few developers dominating the market, with Britain’s 10 largest housebuilding firms building around 60 per cent of new private homes. They believe that insisting local authorities have an up-to-date plan and increasing transparency of land ownership will “put communities back in charge of getting the attractive homes they want and need”. In addition, they are looking to speed up the provision of new housing by making the planning system ‘more open’ and encouraging innovation, such as greater use of modular homes, which can be put together off site in a matter of weeks. Finally, they want to ‘diversify the housing market’, allowing smaller builders to develop; encourage more building of affordable and council homes by housing associations and local authorities, and encourage institutional investment in the private rented sector. And, if you ever fancied building a home of your own, there is even support for you. Some of these initiatives - not all - will impact the private rented sector, so it’s in your interest as a landlord to be aware of how the proposed changes might affect you. If you feel strongly enough about any aspect, you can then give feedback to the government via the consultation process. What’s relevant to the private rented sector? Those who genuinely prefer to rent a home than buy. The supply of suitable housing for all these tenant types needs to be addressed. According to the British Property Federation, there are “80,322 build to rent units completed, under construction, or with planning permission in the UK. The split between London and the regions is almost even, with 38,079 of these in London, and 42,244 elsewhere.” The sector is expected to deliver another 15,000 units each year up to 2030*. The latest figures from Shelter’s Housing Databank suggest there are approximately 1.2 million households on council waiting lists. As the private rented sector or emergency accommodation (often B&Bs) are the only other forms of tenure, the Government’s plans to help increase the number of more affordable and council homes for rent may impact on individual landlords. For example, in Manchester they are building the first new council homes for rent for the first time in five years ( http://www.manchestereveningnews.co.uk/news/greater-manchester-news/new-council-houses-set-built-12557458)* and, according to the Manchester Evening News, are planning to build 56 new homes in Higher Blackley, Moston and Collyhurst, while nearby Salford is planning to build low-cost social housing for the first time in three decades. *Please be aware that by clicking onto the above links you are leaving the Reeds Rains website. Please note that neither Reeds Rains or First Complete Ltd are responsible for the accuracy of the information contained within the linked site(s) accessible from this page.